LED tape is a revolutionary product that allows LED lighting users to put light in places that were once thought to be impossible, and to create lighting fixtures and lighting effects in new and inexpensive ways. In short, it is disruptive technology - and it all starts with a strip. 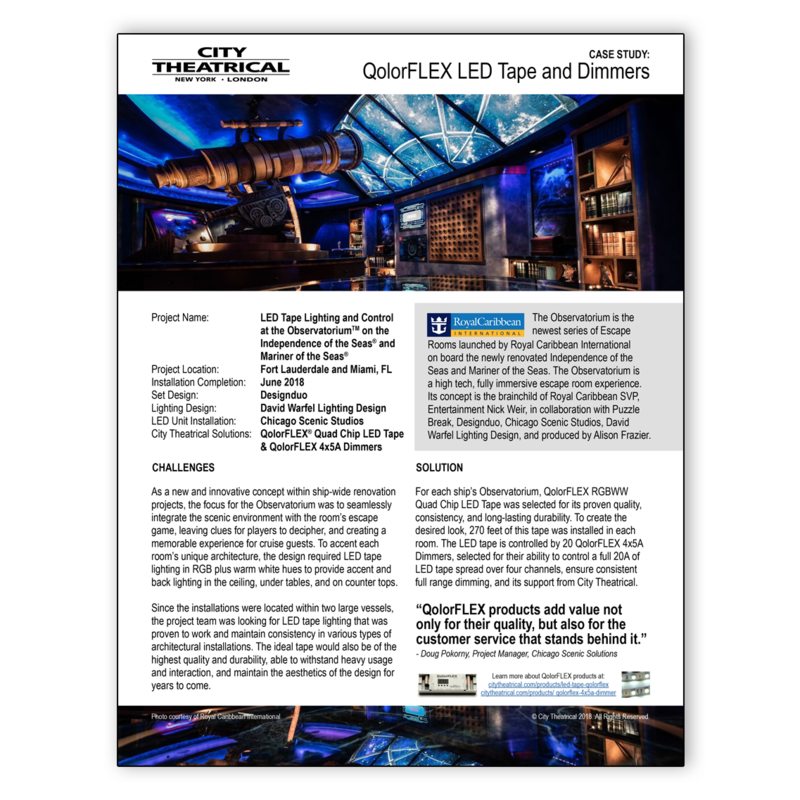 All ETL listed, QolorFLEX® LED Tape is manufactured to City Theatrical’s exact specifications for professional use in theatrical, film, and video applications. QolorFLEX® LED Tape is available in a variety of types such as single color, RGB, RGBA, RGBW, and now 5-in-1 RGBWWCW LED Tape. Each tape includes 5M adhesive applied to the back side to allow for easy peel-and-stick mounting. QolorFLEX LED Tape is available in 5 meter (16.4 ft.) reels or in cut-to-order lengths. City Theatrical can also manufacture custom LED configurations on our in-house surface mount line to suit your exact specifications. For detailed specifications on our QolorFLEX LED tape, click on the catalog numbers below. Explore QolorFLEX Dimmers that pair with QolorFLEX LED Tape. Each type of QolorFLEX LED Light Strip is identified by a part number which consists of 7 sets of characters. Each character set specifies a particular attribute of the tape. Please refer to the Part Number Key to confirm you order the product needed. For a brief description of the different tape attributes, refer to the TERMINOLOGY section below. Refers to the actual chip size of the LED. In general, larger the chip size, the more light output is possible. Single color QolorFLEX LED Tape is available in 2 chips: 5050 (.50mm x .50mm) and 3258 (.35mm x .28mm). Multicolor QolorFLEX types (RGB, RGBA, RGBCW, RGBNW, RGBWW, RGBI) all use the 5050 chip. Our Adjustable White (WWCW) uses the 3528 chip size. QolorFLEX is available in both 12 and 24 Volt configurations. 24 Volt strip allows for longer continuous runs and requires half the amperage of 12 Volt strip to operate. QolorFLEX is available in a variety of different colors and combinations of colors. Single color white stripes are available in cool (CW), natural (NW), and warm (WW) color temperatures. Adjustable white (WWCW) has a combination of alternating cool and warm white chips which can be controlled to achieve a specific color temperature according to preference. Multicolor strips consist of RGB tricolor LEDs plus a fourth color (amber, cool, white, natural white, warm white, indigo) LED, which enables the mixed color output to be tuned and or balanced as needed. This is the number of LEDs contained in a meter of tape. More LEDs produce more light output. QolorFLEX is most commonly sold in full reels which contain 5 meters (16.4ft) of product. Each end of the strip sold this way has a soldered pigtail of color coded ribbon cable for attaching to dimming / power devices. For custom lengths less then 5 meters, "CTL" should be substituted when ordering, and the desired pigtail configuration discussed with our sales department as is needed. For an 18" sample length without pigtails use "0" as the length designation. Please contact your nearest dealer to help with custom quotes. Indicates the approved use environment. IP 20 is Approved for indoor use only, IP 67 is Suitable for outdoor use. Currently, all QolorFLEX Tape is available with a white (1) background color as a standard product. If a background color other than white is required, contact our sales department for custom pricing and lead times. What Makes QolorFLEX® LED Tape Unique? QolorFLEX is a carefully selected family of 40+ reliable and durable LED tapes, dimmers, and accessories for professional entertainment and architecture. LEDs are binned during manufacturing, and all reels are unspooled, rechecked for binning, accuracy, and quality before shipping. Each tape includes leads on both ends, which saves both time and money for lighting and scenic professionals. Ribbon cables are consistently manufactured in a logical RGB order for easy installation. Above photo features multiple products in the QolorFLEX family, including QolorFLEX Dimmers, QolorPIX Pixel Controlled LED Tape, QolorFLEX NuNeon, and QolorFLEX LED Tape. QolorFLEX LED Tape, QolorFLEX 2x5A Dimmers, and QolorFLEX 4x2.5A Dimmers in The Band's Visit on Broadway. Lighting Design by Tyler Micoleau. Set Design by Scott Pask. Photo by Matthew Murphy features Adam Kantor, Bill Army, and Sharone Sayegh. Read the Conversation on LED Tape from the unique perspectives of Tony Award winning lighting and scenic designers, Tyler Micoleau and Scott Pask, from The Band’s Visit to see how they use it for this show and other projects. 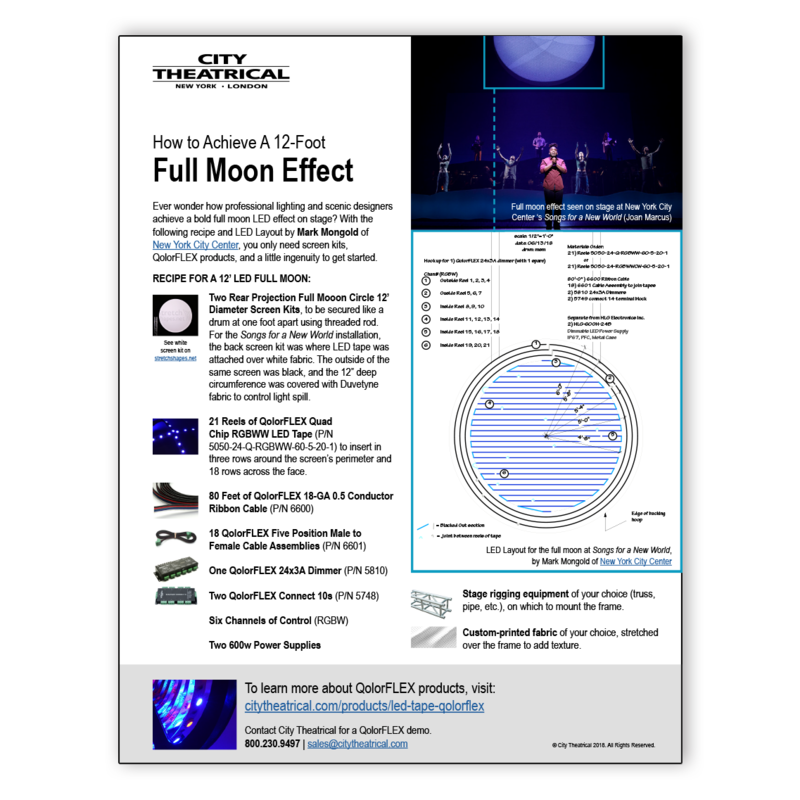 Create a Full Moon Effect with QolorFLEX LED Tape and screen kits, like the one created by Mark Mongold for Songs for a New World at New York City Center. Create a Flame Effect with QolorFLEX LED Tape and a little bit of ingenuity, like the one created for The Tonight Show Starring Jimmy Fallon by Stiegelbauer Associates.